Opportunity is approaching the heat shield that protected the rover from frictional high temperatures during descent through the martian atmosphere in January 2004. The spacecraft carrying the rover jettisoned the heat shield just prior to landing. 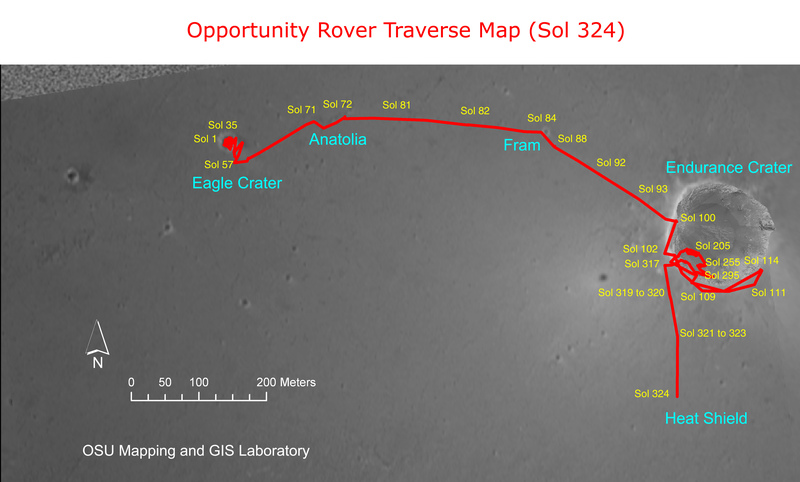 This orbital view shows the course the rover drove from its landing to its 324th martian day, or sol (Dec. 21, 2004), including the historic path of Opportunity's six months of exploration inside Endurance Crater. Opportunity drove 90.9 meters (298 feet) on sol 324, bringing its total odometry to 1,997.8 meters (1.24 miles).